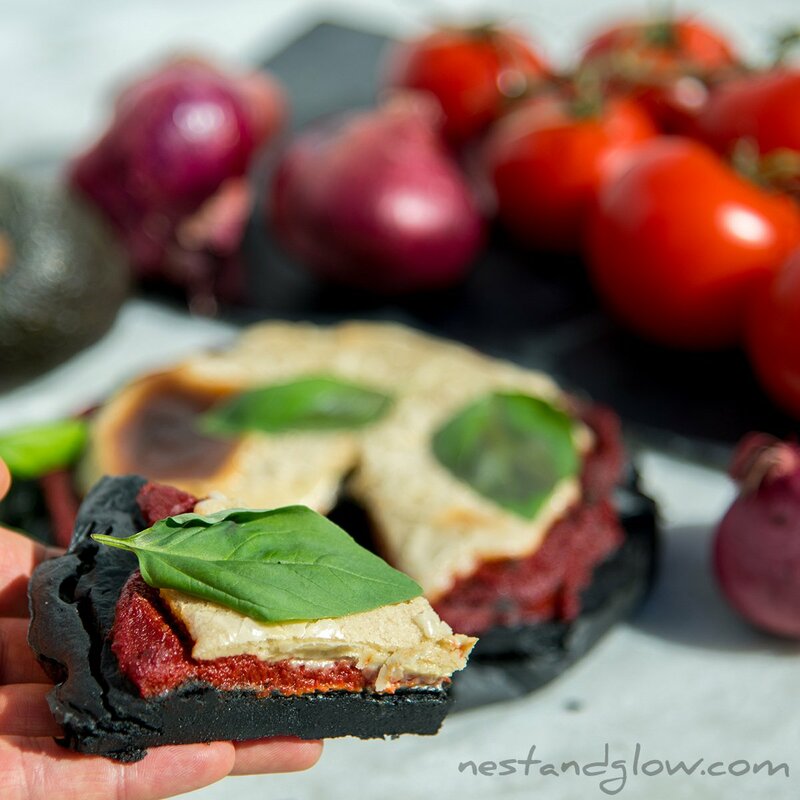 Easy to make gluten-free and dairy-free pizza from scratch. This recipe has no added yeast and is made without xanthan gum. Very high in protein thanks to the seeds (quinoa is a seed) and nuts but also contains all essential amino acids. It works just as well without the activated charcoal but looks a bit less fun. 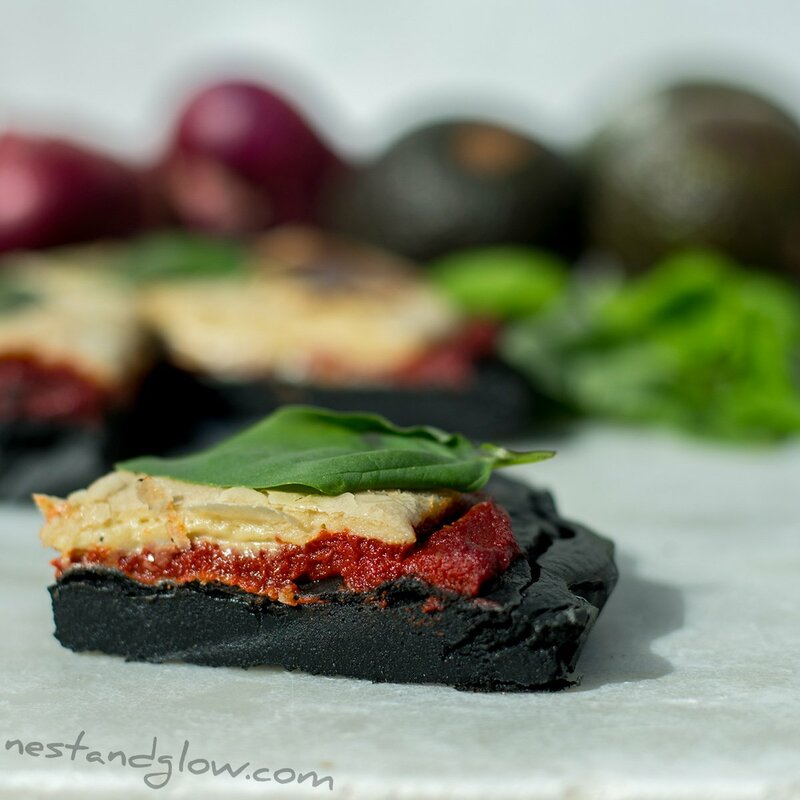 As this makes a pizza that serves two I recommend to make this for four people and double up all of the ingredients then stir the charcoal in just half of the crust to make one black and one white quinoa pizza base. 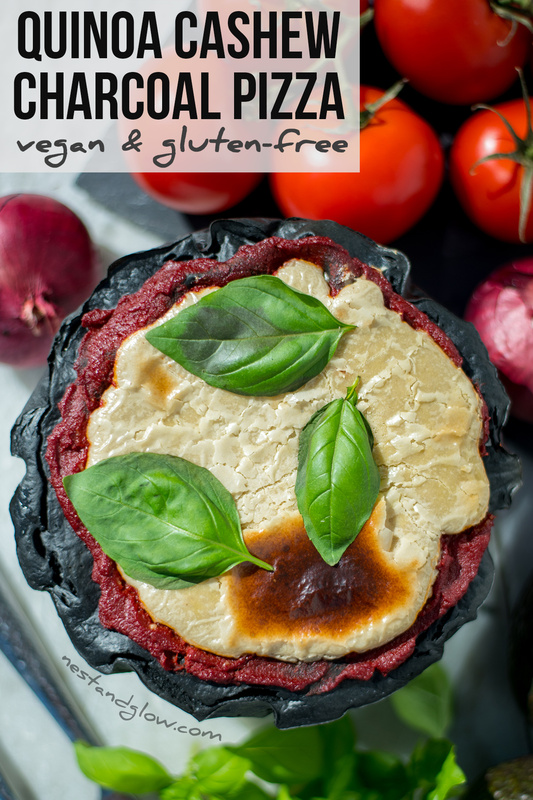 People often call this the best healthy gluten-free pizza dough recipe. Soak the quinoa in water overnight or for at least 15 minutes. Place everything else for the base into a blender and blend until smooth and all the quinoa is broken up. Line an 8″ pan with greaseproof paper or just use a silicon pan and pour in the quinoa batter. Bake for 30-35 mins at 375 F / 190 C, until a knife comes out clean. Let stand for 5 mins and then take out of the pan. Blend all of the cashew ingredients together with just enough water to make smooth. Spread the tomato sauce on, I’m using tomato puree but pasaatta or anything similar works great. Then spread a layer of cashew cheese. Bake for 10 mins with no tray at 375 F / 190 C, just to make it crispy on both sides. View no music Charcoal Quinoa Cashew Pizza Video. No turmeric has been added in this recipe, and that’s rare for Nest and Glow Recipes! Usually a pinch is added to all savoury recipes as a cheap way to add nutrition and a golden colour. 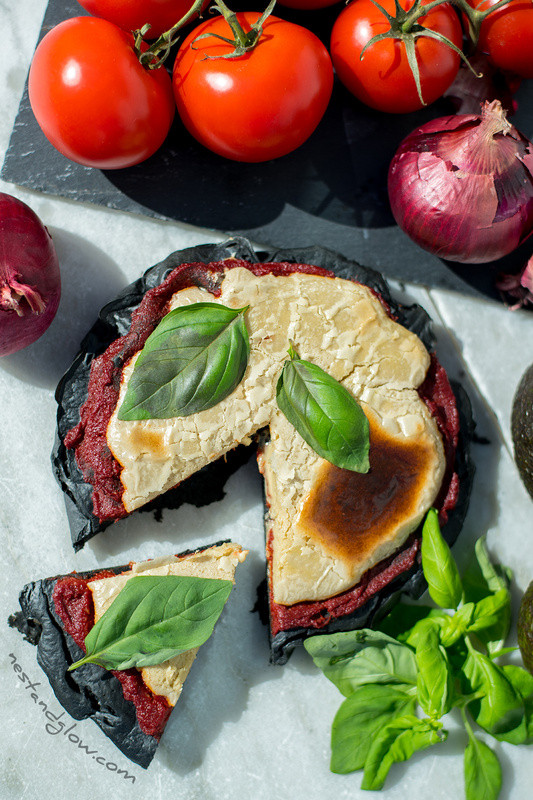 I didn’t want to risk making the base not black (i’m sure a pinch wouldn’t have made any difference though) and wanted a white cashew cheese topping. The most important tip with this recipe is to make sure all the quinoa has been broken up else you will end up with hard bits in the base. A 600w small bullet type blender is enough to do this but a normal smoothie type blender may struggle. The cashew cheese for this pizza was deliberately kept simple and easy. I originally intended to just do blobs on the top but added too much water so ended up spreading a layer of cashew cheese. 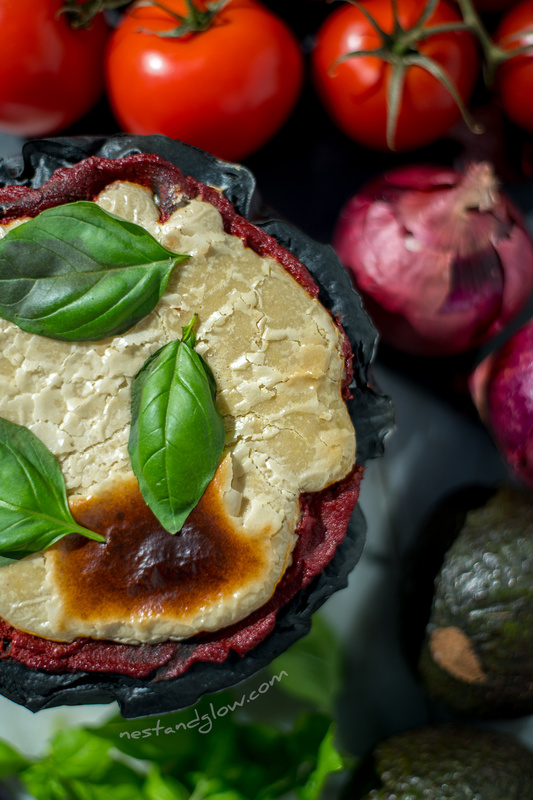 This simple cashew cheese gives a great taste but is maybe not the most aesthetic. 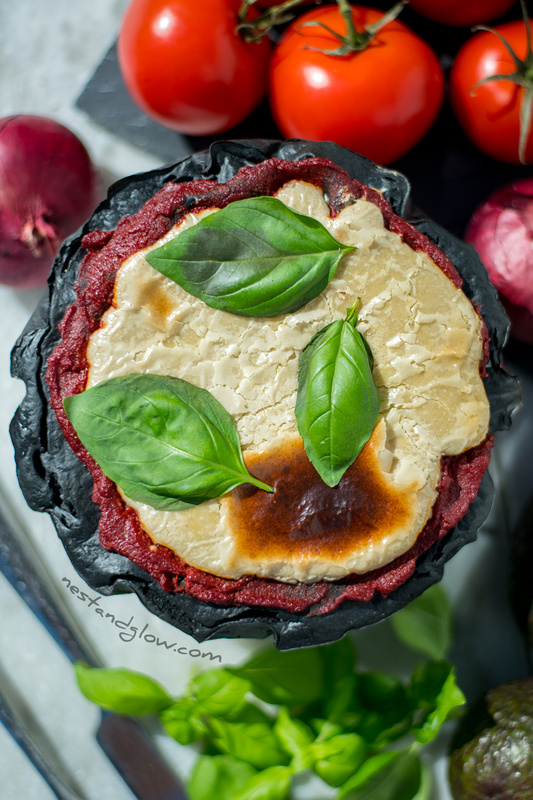 If you have more time I would recommend trying my cashew mozzarella pizza that uses tapioca starch to give a more realistic vegan cheese. Thanks to all my followers on Instagram that I polled showing two photos of this pizza one photoshopped and one with inperfections left in. The result was 76% prefered the non-photoshopped version so that’s what I’m using here. Do follow me on Instagram @nestandglow to help out with future decisions. The basil leaves did sadly go a bit black as it took a while to get the right shot, three sets of leaves were used. But the photos here are a realistic version of what you will get when you make the recipe – no trickery involved here. For full transparency, I do adjust the colours in Lightroom just because I shoot in raw and they do need the tweaking else look washed out. Activated charcoal has some medicinal benefits and is said to help with bloating. Due to its large surface area, it can help with removing toxins and stains from teeth. This recipe can be made nut-free by simply replacing the cashew nuts with pumpkin seeds or sunflower seeds. It’s recommended to always soak your seeds for at least an hour before blending to make them sprout and be easier to digest. I often make this with sunflower seeds as I do eat far too many cashew nuts and seeds are cheaper.